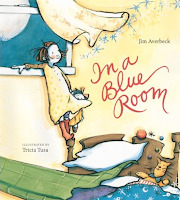 Jim Averbeck's and Tricia Tusa's In a Blue Room is a soothing book that makes an excellent choice for bedtime reading. A young girl is settling down for the night, but she’s partial to the color blue. Her patient mother enters her room to announce that it’s bedtime, bringing her daughter a vase of white flowers. But since the flowers aren’t blue, the girl isn’t interested in them until her mother encourages her to smell them. Then the mother brings her daughter some tea in a brown cup; a soft, green quilt; and some yellow bells on black strings to hang in the window, all met with uncertainty because they aren’t blue. In a Blue Room teaches children that it’s a good thing to experience new colors, sensations, and sounds. And although the girl’s room is yellow, not blue, there comes a moment that night when she does sleep in a room bathed in her favorite color. The last five pages show just how big and glorious the world is outside our bedroom window. Funny thing, getting old. I can’t remember why I walk into a room or what someone’s name is five minutes after being introduced, but I can remember childhood smells, tastes, and places like I experienced them yesterday. It’s nice, though, when local author Tim Hollis puts them all together in a book for me. It’s been a pleasure flipping through his new book, Vintage Birmingham Signs, and reminiscing with family and co-workers about the places that starred in our childhoods. In the introduction Hollis explains that there are more neon signs represented in his book, but only because the neon sign companies were more diligent about archiving their signs. Many of the photos are courtesy of the popular nostalgic Website Birmingham Rewound. Since the signs speak for themselves, there is only a brief description surrounding each photograph, so the book is 127 pages of black and white photographs that tell the story of Birmingham’s commercial history. Readers will be disappointed if they're expecting to see the famous Merita bread company sign that showed slices of bread falling onto a plate, or the Strickland tire man that my siblings and I dubbed Big Man. Hollis has searched for these photographs with no luck. I'm enjoying the memories this book has dredged up: my mom buying her cigs at San-Ann; my dad working at Burger In a Hurry as a young married man; the Yellow Label syrup jar we passed by on our Friday night grocery trips; the crispy fried chicken and apple fritters served up at Catfish King; going for a Sunday drive and stopping at the Spinning Wheel for a chocolate-dipped vanilla cone; buying my favorite pair of groovy, purple bell bottoms at Burger-Phillips. The only photograph I object to is the Laff in the Dark building at Kiddie Land. The only time I thought I would ever see this place again was in my nightmares. Tim Hollis will be at the Central Library next Wednesday to talk about his new book at the Brown Bag Program. 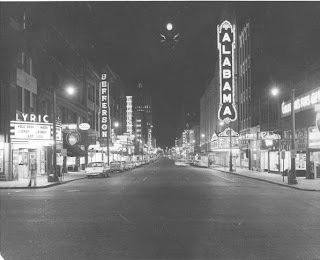 Birmingham’s streets were once lined with signs, from glowing neon to advertisements painted on brick walls. Birmingham author Tim Hollis will discuss the golden era of roadside advertising and sign copies of his new book, Vintage Birmingham Signs. Wednesday, June 25, noon. BPL would like to announce a wonderful new database for children and parents called BookFlix. 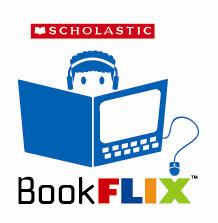 Designed for grades preK-3, BookFlix is an interactive literary resource that builds a love of reading and learning by pairing classical video storybooks from Weston Woods with nonfiction eBooks from Scholastic. 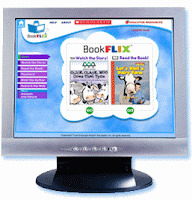 BookFlix is accessible to every child—early readers, reluctant readers, and English Language Learners. The categories are various and should appeal to every child’s interests: Animals and Nature; Earth and Sky; People and Places; ABC’s and 1,2,3’s; Family and Community; Music and Rhyme; Adventure; Celebrations; and Imagination. Here’s how it works: Watch the storybook video, say, Good Night, Gorilla, and then read the paired nonfiction book Who Works at the Zoo? Then, for fun, click on Puzzles and play Word Match, Which Came First? and Fact or Fiction. Then it’s on to Meet the Author and surfing the selected Websites for additional information on the subject. BookFlix is a great resource for children moving from fiction-only reading to exploring nonfiction. You already know that gas prices are rising and food prices are up so a raise would be great right? If so, give yourself one by trying some of the tips in Living Rich by Spending Smart: How to Get More of What You Really Want by Gregory Karp. 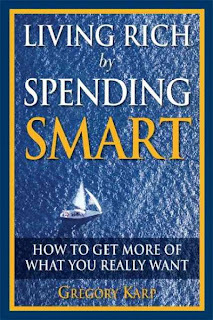 This book is overflowing with practical information on getting more of what you want by spending wisely. For example, simple ways to save on gas are on page 98. Want better clothes for less see page 120. Keeping more money when filing taxes is on page 151. 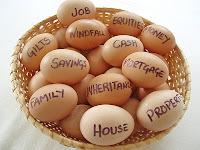 Keep in mind that these are real world ideas presented in an entertaining writing style that aim to help you keep more of the money you earn without gimmicks or deprivation. My favorite section begins on page 109 where the author explains how the average family can save hundreds of dollars a year on magazines, books, Internet access, DVDs, and music CDs. On page 110, he describes how to attend cultural events like plays, concerts, and other cultural events for free. How? What is this section about? You may have guessed that in my favorite section, Mr. Karp writing about the public library. The Calder Game by Blue Balliett is a fast paced mystery filled with unusual characters, adventure and puzzles to solve. Three seventh grade friends, Calder, Petra and Tommy, work together using their unique talents to solve the case. Calder plays with pentominoes and loves a good puzzle. Petra has a passion to write and enjoys exploring word games. Tommy loves to collect things. The story is built around Alexander Calder, a famous American artist and sculptor. Alexander Calder had a passion for creating mobiles. Each mobile was a kaleidoscope of movement and form, changing depending upon the perspective of the viewer. The ephemeral nature of the art piece gives a dream-like quality to each work. Each piece of the mobile works together to create a unified whole, a fascinating work of art that always changes, never the same. We each see works of art differently based on our perspective and what is already in our own mind. Calder Pillay travels with his father to a small English village. Many unusual characters live in this village. And there is a strange aura surrounding the area. An Alexander Calder sculpture in the village square suddenly disappears. And later, Calder Pillay disappears as well. Calder’s friends suddenly must fly to England to help his father find out what happened. What is the mystery surrounding this small village and where is Calder? What happened to the sculpture? Youth as well as adults will enjoy reading this book. The novel explores art and suggests that we should be open, flexible and look at art from different perspectives. If you like art-themed books and baffling mysteries or puzzles, this book will be just the thing for you. You might just learn some things that you did not know about Alexander Calder as well. The Butterfly Alphabet , by nature photographer Kjell B. Sandved , is a magical tribute to butterflies told through poetry and close-up photography of butterfly wings. Each butterfly wing has been photographed to reveal a letter of the alphabet. The wings of butterflies, including the Swallowtail butterfly and spectacular blue Morpho , are displayed as color close-up works of art. Each butterfly is given a two-page dedication. The left side displays a small picture of the butterfly, a poetic verse and the name of the butterfly. The right side is a full color page of the magnified detail of the butterfly’s wing. Believe me, this is extraordinary work! In fact, the author spent twenty-five years photographing the butterflies in this book. The book can be enjoyed by anyone, including adults and children. Parents, this is a fun way for children to learn the alphabet! The butterfly wings are expressions of the extraordinary beauty that can be found in nature. This book will transport you to an enchanting place through the fluttering, fanciful beauty that can only be found by observing the simply magnificent butterfly. Hip Hop Artist Shaheed brings his unique blend of music and rhymes to the Birmingham Public Library’s Atrium on Thursday, June 19, at 6:30 p.m. He will be accompanied by Supreme, the Birmingham disc jockey with whom he has collaborated on his latest album. Shaheed’s latest album, Health, Wealth, and Knowledge of Self, is a unique collection that combines excellent beats-reminiscent of early hip-hop pioneers- with highly emotional lyrics and complex rhymes. His executive producer, Supreme, mixed most of the album with help from March the 5th and Heron Sparks. The Birmingham Public Library is excited to host such a dynamic and passionate artist for BPL@Night. Renowned as a crowd-pleasing performer, Shaheed is sure to put on a show. Supreme will accompany him on the record board. The Atrium at the downtown library will provide a unique atmosphere with its echoing acoustics that will no doubt lend itself to Shaheed’s hip-hop sound. This event is free and open to the public. Everyone is welcome to attend. For more information about Shaheed, visit his MySpace page at http://www.myspace.com/shaheedtawheed. For information on Supreme, visit http://www.myspace.com/supremeonline. 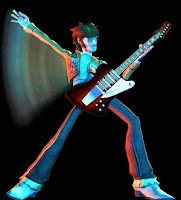 Try them out for yourselves and see what you think about Guitar Hero, DDR, Rock Band and others. Join us for a hands on day of fun! Check it out for yourself! Wednesday, June 18, noon. Free horticulture "short courses" will be offered at Avondale Library this summer. The first class is scheduled for Monday, July 14th at 6:00 p.m. "Programs or topics offered will be based on existing Extension programs, but can be tailored to address area-specific issues," according to Sallie Lee, Jefferson County Extension agent. The gardening course will cover how and what to plant; animals, insects, and diseases that can cause problems; vegetable and container gardens; turf grass; termites; care of trees and shrubs; and much more. Sign up by email at cwcamp@bham.lib.al.us, or by calling 205-226-4000. Sponsored by the Jefferson County Library Cooperative and the Alabama Cooperative Extension System. Her name says it all. Once again we are privileged to present Birmingham’s own storyteller, Delores Hydock, with more stories to share with her adoring fans. The Birmingham News wrote: “Her stories are smart but not cynical, heartwarming yet not corny, traditional without being mundane.” Wednesday, June 11, noon. can you soar like an eagle? whoosh-shoosh-glide! can you swing like a chimp? swoop -swoop-slide! Rufus Butler Seder's Gallop! is a magical book that shows children the movement of different animals. 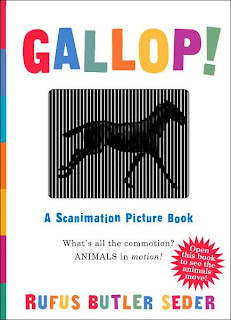 Flipping each page will start the next animal galloping, running, flying, swinging, or strutting. The menagerie of animals illustrated in the book are a horse; a rooster; a dog; a cat; an eagle; a chimp; a butterfly; a turtle; and ends with a twinkling star. The procedure is called Scanimation, and was created by Seder, an artist with a fasciation for antique optical toys. The recommended reading level is ages 4-8, but I can't imagine any baby or toddler who wouldn't be just as mesmerized by the animals' movements across the page. Darjeeling Limited is a comic, yet emotional movie that captures the lives of three American brothers as they take a train trip to India. 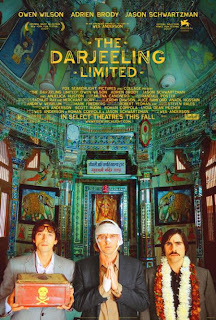 They travel on the Darjeeling Limited, a bright colored train that is filled with unusual characters and comic adventure. According to Francis (Owen Wilson), the purpose of the trip is to develop tighter bonds between brothers as well as make the trip a spiritual journey. They have been separated for some time and Francis believes that this trip is just the thing to bring the brothers closer together. Prior to this trip, Francis had been in a car wreck in which he was catapulted 50 ft. into the air. He dramatically related the tragic event in great detail. He stated that his heart stopped and he was dead at that point. However, during this ordeal, his one thought was that he wished Peter (Adrien Brody) and Jack (Jason Schwartz) were there for him. Therefore, he has decided that during this journey, they will visit all the spiritual sites, learn about the unknown, say yes to everything and start trusting one another. Francis believes that this trip will be a life changing experience. The colorful journey begins as Francis, the oldest brother, decides to take charge and plans a complete itinerary for the trip. He makes all of their decisions, including where they will sleep and what they will have to eat. Francis has decided to have his assistant laminate the paper schedules. He brings a printer and laminator along on the journey. The three brothers take a variety of medicines including an Indian muscle relaxant and a special Indian flu medicine along the way. Let the fun begin! A variety of comic mishaps take place during the excursion. A snake which belongs to them escapes on the train, the brothers are asked to leave the train and they are left alone on an Indian desert. Meanwhile, their mother who is also strange is missing. The film is very colorful and captures the beauty of India, including the landscape, markets and spiritual sites. What else is in store for the three brothers along their journey? And where is the mother of these three adventurous men? Watch the film to find out. You’ll laugh and feel the comedy, tragedy and emotion as these three men take an unusual excursion.